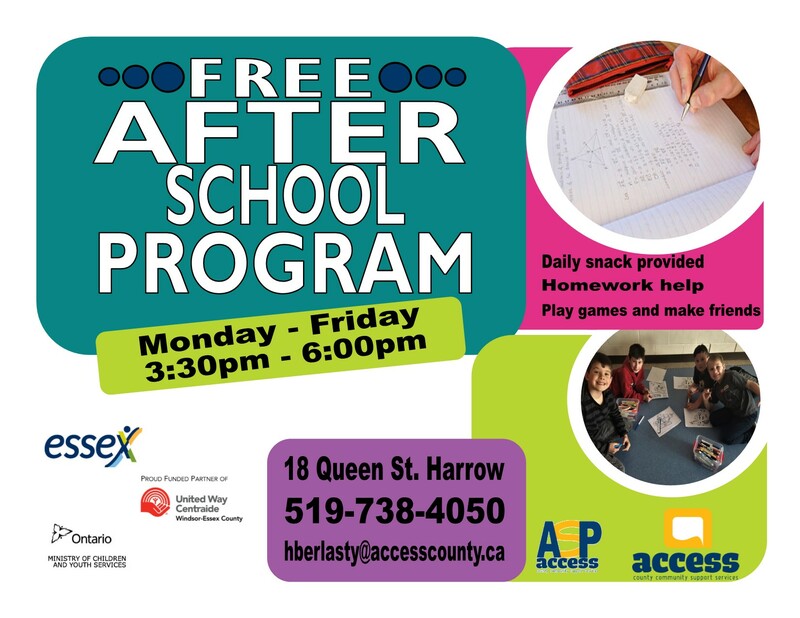 The ACCESS Harrow Youth Centre offers a FREE after school program that runs Monday through Friday from 3:30 – 6:00 pm. Our program is available for anyone in Grades 1 through 8. We pick your children up from their school and walk with staff and volunteers to our Youth Centre. Our program has an emphasis on teaching kids how to live a healthy lifestyle and how to have fun while doing it! Our daily activities include nutritious snacks, healthy eating and nutrition tips, personal health and wellness tips, physical activities, homework assistance, social skills and so much more! We also offer a weekly arts and crafts day on Thursday’s during our program. 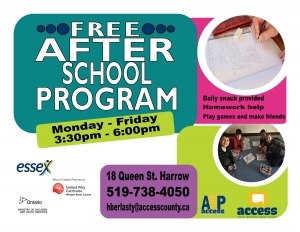 We also offer evening programming for high school youth, thanks to a generous donation from Libro Credit Union. We will be hosting monthly dances throughout the school year for 2 different age groups. They will be offered to Youth in Grades 5-8. Our dances will be held in the upstairs room at the Harrow Arena. Check our Website and Facebook pages for upcoming dance dates. **Please note: Youth must be registered to attend our dances. You can pick up a form at our Harrow Youth Centre, at the Harrow Arena or print from our site.